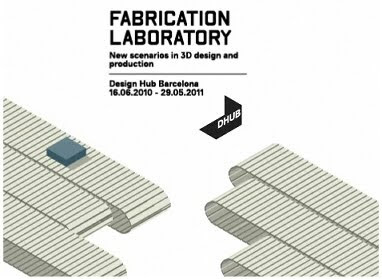 Fabrication Laboratory, organised by the DHUB, consists of not one but a series of activities (exhibitions, real-time fabrication laboratories, workshops, lectures, etc.) that offer a comprehensive overview of 3D digital manufacturing technologies, a new reality in constant evolution that is producing a fundamental transformation of design and production processes. The exhibition format of the Fabrication Laboratory is an open infrastructure, allowing its initial form to be changed and expanded as new content is produced. As a result, the laboratory will gradually consolidate a process of ongoing analysis of the new scenario in production. The objects developed using new technological tools (such as CNC software and machines) and the ability to individually customize mass production (mass customization), together with open source design systems (interactive algorithms), are calling into question the future of the traditional model/series approach of industrial design. Digital fabrication technologies offer new opportunities for design professionals in the 21st century and are ushering in a more flexible project methodology capable of adapting to meet different and changing needs. The impact of this new technological paradigm is felt in every phase of the production process, from concept to materialization, from distribution to consumption. Moreover, it is paving the way to the promise of participation, personalization, and the practicability of the unique piece.